Viber Shouts: this special feature gives special sounds to the individual messages inside the chat. This background music helps in stressing the importance of messages and identifying which one needs immediate attention. Favorites: We love this feature as it allows you to save your favorite YouTube video, GIF or any other link at one place. These favorite links can be found in one place and they can be easily shared with anyone. Location: With this useful feature, you will be able to instantly share your current location with your friends so that they know where you are holidaying, eating dinner, or watching a movie. To ensure that the user’s privacy is not compromised, this feature is enabled only if the user desires to share his location. This feature may also be used to share information regarding an amazing restaurant or food joint you discover. 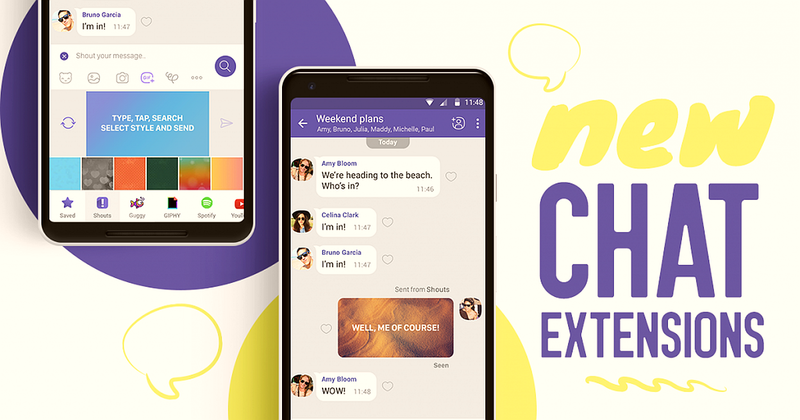 The new chat extensions enhance the productivity of the app and give instant messaging a powerful boost. The developers of the application are constantly striving to improve the communication experience of the users and the chat extensions are a result of this effort. ‹ Download Viber Out from the Market and enjoy it!